On May 30, 2013, His Beatitude Patriarch Theophilos III of Jerusalem, who is on an official visit to the Russian Orthodox Church, venerated shrines in the northern capital city. His Beatitude visited the Cemetery of Our Lady of Smolensk. In the cemetery church of Our Lady of Smolensk, the delegation from Jerusalem sang the Paschal Troparion. His Beatitude venerated the revered copy of the Icon of Our Lady the Hodigitria and gave the benediction to the faithful. Then the guests proceeded to the Chapel of the Blessed Xenia of St. Petersburg to bow before her tomb. His Holiness Theophilos also visited the Cathedral of St. Isaac. He was welcomed by the director of the State Memorial Museum ‘The Cathedral of St. Isaac’, who presented the guest with an enamel image of the church. 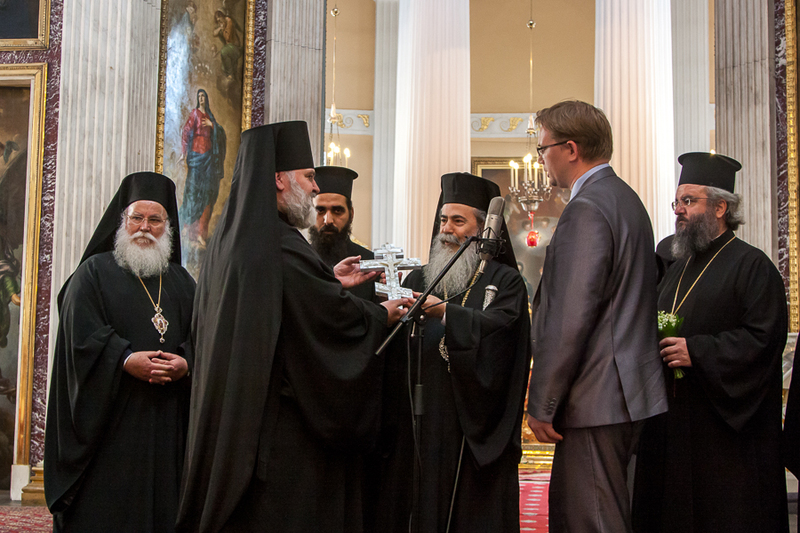 On his part, Patriarch Theophilos presented the cathedral with a pearl cross and an icon of Our Lady of Bethlehem. Patriarch Theophilos gave the benediction to those who were in the church from the ambo. At the Icon of St. Isaac of Dalmatia, who was venerated by Emperor Peter I in a special way, the delegation of the Church of Jerusalem sang the troparion to the saint. In the Cathedral of Our Lady of Kazan, Patriarch Theophilos was presented with a bouquet of white roses on behalf of the parish community. He venerated the Icon of Our Lady of Kazan. In response to the rector’s remarks about the miracle-working copy of the Icon of Our Lady of Kazan as one of the most important shrines in St. Petersburg, His Holiness mentioned a replica of the Kazan Icon in Jerusalem, saying, ‘From childhood to this day we have venerated this icon. A meeting with it today is a blessing for us because it protects us as well’. After that His Beatitude visited the Cathedral of the Holy Resurrection-on-the-Blood. At the place where Emperor Alexander II was fatally wounded, the delegation sang ‘Eternal Memory’. The Primate of the Orthodox Church of Jerusalem arrived at St. Alexander Nevsky’s Monastery of the Holy Trinity to the sound of bells. He was welcomed by the abbot, Bishop Nazary of Kronstadt, and the monastic community. His Beatitude venerated the relics of the Holy Prince Alexander Nevsky. Welcoming the guests, Bishop Nazary said that the year 2013 was a special one for the monastery as it marked its 300th anniversary. ‘And your visit is another important event in this memorable year’, he said. Addressing the monastic community and the faithful, His Beatitude Theophilos said in particular, ‘We are very much moved by the warm welcome accorded us by His Holiness Patriarch Kirill of Moscow and All Russia and the honourable bishops and fathers and the pious Russian people’. He noted that ‘from the very first days of the Baptism of Russia, Patriarchs of Jerusalem used to come to Russian lands to testify that the Russian Church, which was yet in the process of development, was an integral part of One Holy Catholic and Apostolic Church and that roots of the Orthodox faith of the Russian Church were in the Holy Land. During our brief visit we have felt as though we were in the Russian Jerusalem as we could see frescoes and images depicting various places associated with the Holy Land. For us, St. Petersburg is of special importance because it is a place from which great saints have shown forth’.